Over 400 members of the Bhujel community met chief minister Mamata Banerjee at Bagdogra airport today and submitted a memorandum demanding a development board. 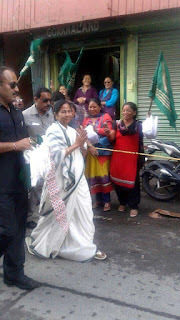 Mamata landed at Bagdogra around 2.45pm for a five-day trip to the Darjeeling hills. Soon after she walked out of the terminal, Mamata went up to the Bhujel community representatives and accepted the memorandum drafted by the Bhujel (Khawas) Cultural Association. "This is the sixth time that we met the chief minister and submitted our memorandum to her mentioning our demand for a separate development board. We met the chief minister for the first time in September last year. We had explained that the board was necessary to preserve our rich culture and tradition, which are on the verge of extinction," Kumar Khawas, the general secretary of the association, said. "The total population of Bhujels is around 60,000 and we live in all three hill subdivisions, the Terai and Dooars. We are economically, socially, politically and educationally a backward community and most members live in tea estates, cinchona plantations and forest villages. Most are daily-rated workers and only a handful of Bhujels pursue higher education. A development board can help bring about comprehensive development for the community," Khawas added. The state government has formed seven development boards in the hills - for Lepchas, Bhutias, Sherpas, Tamangs, Rais, Mangars and Limbus. On Saturday, a government official had said the state intended to form the West Bengal Biswakarma Welfare Board for the development of communities like the Kami, Damai and Sarki. Khawas, who is a teacher, said: "In March this year, before the Assembly elections, we had met the chief minister and she had assured us that she would look into our demand after the polls. We have complete faith in her and we hope to hear an announcement that we Bhujels will have a development board soon." Over 400 members of the Bhujel community met chief minister Mamata Banerjee at Bagdogra airport today and submitted a memorandum demanding a development board. Mamata landed at Bagdogra around 2.45pm for a five-day trip to the Darjeeling hills.